I've been in Wheaton a long time; July 4, 1981, to be exact. We moved into the house on Prospect St in December of 1983. The tree at the northwest corner of the house was there when we moved in. I didn't know what kind of tree it was. 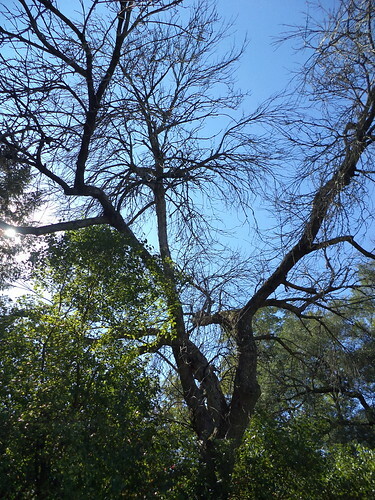 I knew that it tended to shed branches and was the first to leaf out in the spring and drop leaves in the fall. In 1996, after the leaves fell, we discovered a wasp nest high up in the tree. It was 1 1/2 times the size of a basketball. I climbed up on the roof and knocked it down, ironically, with a basketball. 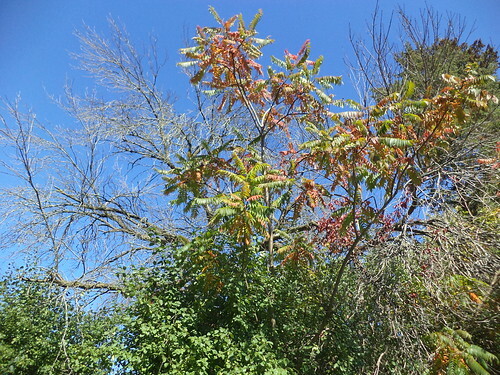 I never really thought too much about it until last year, when I noticed it didn't leaf out as much as in past years. 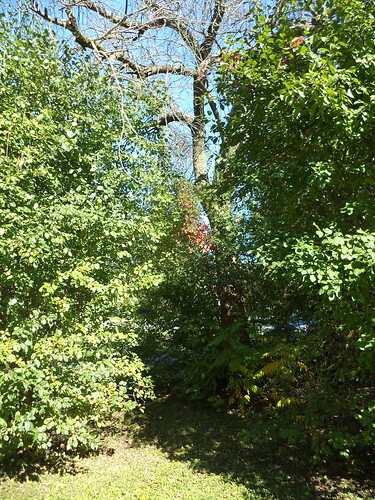 The City of Wheaton took down a dead ash tree at the southeast corner of the drive way and it occurred to me that tree was the same as the one at the northwest corner of the house. 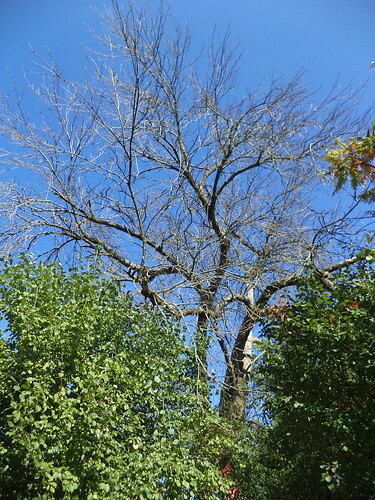 The ash in the parkway was felled by the Emerald Ash Borer, a noxious pest that has savaged our once beautiful trees. My tree never had any leaves on it this year. I knew it had to come down so I've spent the summer saving. It makes me sad. It's so tall and majestic. I've been concerned over the summer, as the summer storms roll through with the heavy rain and winds. With it so close to the house and quite dead, what are the chances of losing a branch. You can see how it forks. The neighbor's drive is 6 feet off the tree to the north. They had concerns about the branches over their property, and rightly so. Eventually, structural integrity fails and this thing called "gravity" takes over. If I don't take it down, I could be paying for a new car or repairs to a house. Ironically, in the last strong wind event, the maple in the parkway lost a branch. This dead tree did not. So, next Thursday, October 29th, in the afternoon, the whole thing comes down. The company doing it is also going to remove a lot of the trash trees which have grown up around the base, making mowing a bit of an adventure. Understand that in addition to a sense of loss and sadness associated with the removal, I have a lot of conflicting feelings. The amount of birds in the yard, particularly in the northwest corner have been phenomenal this year. I've seen a huge abundance of chickadees, cardinals, flickers, titmice, robins and sparrows. Bugs love dead wood and birds love bugs. The large amount of what I term "trash trees" on the north and west sides provide excellent cover for birds from predators, although I don't have many of those. I haven't seen any signs of feral cats in my yard and I don't have hawks around either. It's been a lot of fun to sit on the deck and be scolded by an unseen chickadee. Or to look up and see a bird hopping from branch to branch and then have to run get the birding guide because I don't recognize it. All of the above, except for the pine trees and the lilac are going away. I am having them leave the truck about 3-4 feet tall and leveled. I bought a ground feeder and I'm going to mount that feeder to the trunk. I intend to add seed and the occasional batch of peanuts or other squirrel delights to it. Clearing out the volunteer trees will also allow me room to get at the north window where I can hang a window feeder. It's so overgrown that it's hard to get to that location. I hope the birds and squirrels don't leave. The tree is a hazard, unfortunately, even if it's providing wonderful habitat. There will be photos. I've made my peace with this. Still, it's like losing an old friend. I need to ask for a slice of the trunk as a memento.